Halo Recruit is a Windows Mixed Reality experience for Microsoft's Windows 10 made by VR developer Endeavor One in partnership with 343 Industries. On October 17, 2017, Halo Recruit became available for fans try out in participating Microsoft Stores, and as a free download from the Windows Store. Halo Recruit requires a Windows MR headset in order for players to play. First mentioned about at IFA Berlin 2017 in late August, Halo Recruit was announced and presented by Alex Kipman and Bonnie Ross during a Microsoft media event in San Francisco on October 3, 2017. Halo Recruit is Microsoft's first take on a virtual reality powered Halo experience. The five-minute MR experience provides a light introduction to the world of Halo and some of its most iconic characters and weapons. 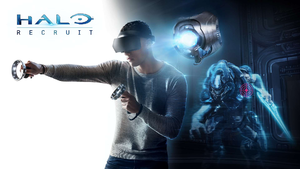 It has players assume the role of an unnamed United Nations Space Command recruit, who is put through a virtual reality shooting simulation against Covenant remnant targets.